The Geo Dress is a relaxed, batwing shape with a round neck. Its raglan sleeves create strong geometric lines from the neckline all the way down to the side seams. These seams incorporate deep, comfortable pockets, and are topstitched for emphasis. The dress fits gently into the waist and hips and finishes just above the knee (for 5ft 8 height). It pulls on over your head – no zip required. It can be sewn in either woven fabrics or stable knits such as ponte or scuba, or a combination of both using the contrasting panels. We recommend you size down if using a knit. 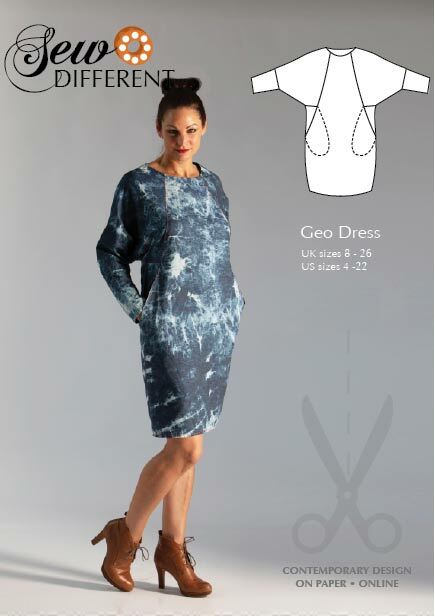 The Geo Dress is a multisize pattern that comes with fully illustrated instructions and all the information you will need regarding fabric and pattern layout.